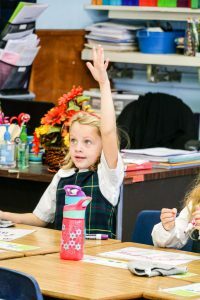 St. Jude the Apostle School offers a competitive academic program, following the entire New York State curriculum in conjunction with the curriculum of the Albany Roman Catholic Diocese. We are a Middle States Association Accredited school, recognized for our devotion to our mission, high academic standards, and commitment to addressing the concerns of our parents and the needs of our students. Within the prescribed curriculum and course of study, teachers have the flexibility and are encouraged to be creative in the design of their instructional patterns. They are encouraged to use a variety of techniques and methods of approach in the teaching of their subject matter, always with the focus on motivating students and meeting their individual needs and learning styles. Upon graduation, many of our students secure academic scholarships to some of the area’s finest middle and high school programs. Religion is an integral part of our school program and as such, religion lessons and the Gospel message are taught each day. Students of all denominations are welcome in our classrooms and invited to learn about God’s love. Students partake in daily prayers, school liturgies and student service projects throughout the year. In addition to our core curriculum, we offer a broad range of extra-curricular activities, including: Spanish, Technology, Library, STREAM, Music, Art, Physical Education, Instrumental Music, School Chorus, Bowling, Drama Club, After School Sports, and more. Every teacher at St. Jude the Apostle School has been trained in New York State Learning Standards Based Curriculum grades Pre-K-6 issued by the New York State Department of Education. The Catholic Schools of the Roman Catholic Diocese of Albany embrace the State Learning Standards with excitement and challenge. As we move ahead in this journey together, we are confident in the many talents and gifts that God has given us to achieve our fullest potential for His honor and glory. With our hand firmly grasped in His, we move forward recognizing that the work of our hands is truly His own.